There is nothing as awesome as a homemade turkey. Kid #2 and I were having a conversation about what we were looking forward to for Christmas and we both unanimously agreed that turkey was the one thing we wanted for Christmas dinner. Turkey that has been pre-roasted and store bought is plain awful. And the other advantage of making your own turkey is that you get to eat all the leftovers. Kid #2 loves turkey sandwiches and I personally adore our version of turkey stew. There is never enough leftover to go into a turkey pie, although I might have a chance soon because I have the biggest turkey ever in my fridge. Kid #2 as a toddler, giving her best carnivore-cavegirl look while tackling a turkey leg. I’ve been roasting turkeys for Thanksgiving and Christmas for more than 10 years. Back when we were staying in the US, the neighbourhood Pathmark supermarket would give out free turkeys around Thanksgiving to loyal customers (which, of course I was one). The turkeys were not big, but would cost about $40 – 50 in Singapore and were well worth it. 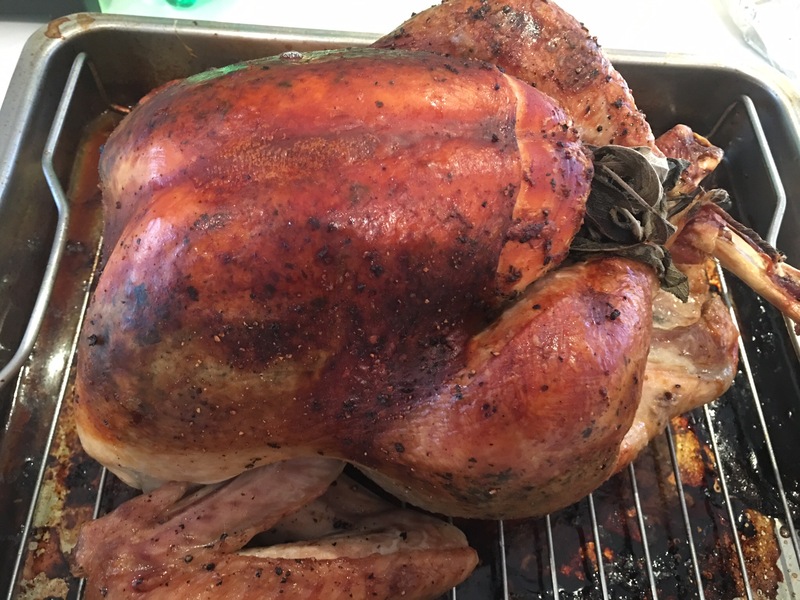 I remember my first attempts in making turkey and trying to keep the breast meat moist – I tried basting, sliding butter under the skin and even putting a wet muslin on top of the turkey but nothing ever worked. Until one day I came across a recipe in Bon Appetit magazine which used a pancetta-sage butter mix under the skin. That was the most successful turkey ever because the saltiness of the pancetta penetrated the turkey breast and the fat from the pancetta combined with the butter kept the turkey absolutely moist all through the whole cooking time. I have been using the same recipe for the past few years but this year I realised that Cold Storage had been jacking up the prices of absolutely everything and the pancetta was about 30% more expensive than the previous year. So in principle, pancetta is just expensive Italian bacon, so I switched the meat to regular smoked bacon this time. The verdict? Not bad at all. The only thing was that I kept a bit of pancetta in the turkey gravy, which would probably be less chunky than if I used bacon instead. 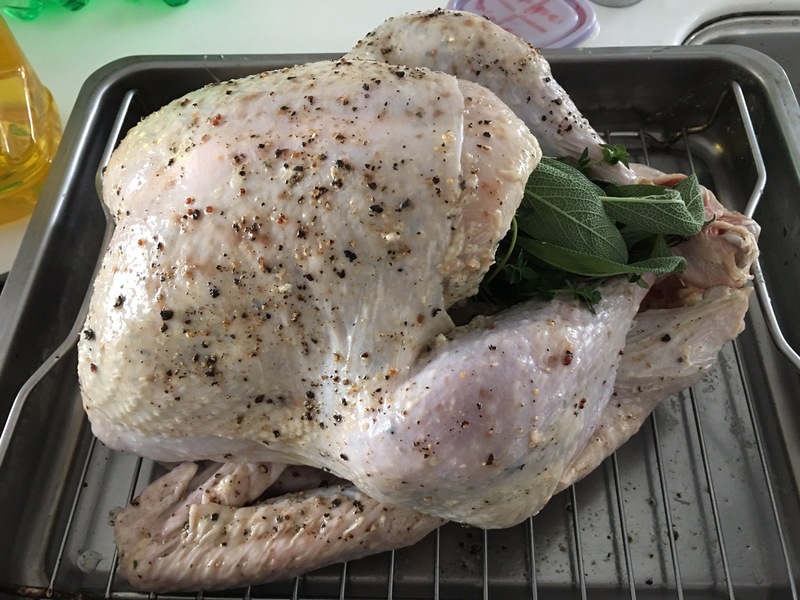 The pictures in this post are of a really small turkey (the smallest I’ve ever roasted; only 5 kg heavy bird; compared to the almost 9 kg one I have right now). The wonderful thing about this recipe is that nothing changes except perhaps the roasting time, which a leave-in meat thermometer would accurately reflect. I am so looking forward to turkey at my family Christmas dinner tomorrow! Add the bacon and chope further till fine. Mix in the cheese, butter, olive oil, rosemary, sage, and black pepper and process till finely mixed. Transfer into clingwrap and roll into a sausage shape and refrigerate. Bring the broth, carrots, celery, onion, parsley stems and turkey innards to boil, then lower the heat and simmer for about 1 ½ hours. Strain the stock and cool. Prepare the turkey a day before the turkey is needed. Defrost the turkey by placing turkey, still in its casing into a bucket of water at room temperature. Rinse out turkey and pat dry. Separate the skin from the meat of the breast and drumstick and thighs carefully with your fingers. Cut the bacon-sage butter into ½ – ¾ cm thick slices, then slide under the skin over the breast, thighs and thighs. Spread the remaining bacon-sage butter in the turkey cavity. Tie the legs together with chicken twine and tuck the wingtips under the body of the turkey. Take 2 tbsp butter and rub over the skin of the turkey. Sprinkle salt and pepper over the skin. Place in roasting pan and cover with clingwrap. Chill in refrigerator till using. On the day of the cooking, preheat the oven to 170 deg C.
Remove turkey from refrigerator. Drizzle the olive oil over the skin of the turkey. Stuff any left over herbs you have into the cavity of the turkey e.g. sage, rosemary or parsley. Cover the top of turkey with a sheet of aluminium foil. Insert a meat thermometer into the thigh of the turkey. Pour 2 cups of turkey stock into the roasting pan. Carefully place the turkey into the oven. Roast the turkey in the oven till the inner temperature is 165 deg F or 75 deg C (3 – 3.5 hours). Baste the turkey with the turkey stock. Remove the aluminium foil about 1 to 1.5 hours into cooking. Remove from oven and tent with aluminium foil. Rest the meat for at least ½ hour then carve. 50 g of finely sliced pancetta or any kind of Italian bacon/ham. Heat 2 tbsp goose fat or bacon fat in a large saucepan. Sauté the pancetta till beginning to crisp, for about 5 minutes. Add the shallots and sauté for about 1 minute. Add the arrowroot or low carb flour and whisk till golden for about 4 minutes. Mix in white wine, turkey stock and rosemary and sage for about 5 minutes.